The question never goes away: "Shouldn't hummingbird nectar be red?" The answer is an unequivocal "NO!" Here's my Top 5 reasons why. The great majority of hummingbird feeders on the market, and certainly the hummingbird feeders at our Wild Birds Unlimited shop, have enough color on them (red or otherwise) to attract hummingbirds without the need for red dye in the nectar. Admittedly, there is no scientific proof that red dye #40 definitely harms hummingbirds but knowing its source, why chance it, especially if it has no benefits to the hummingbirds and will not attract hummingbirds any more than clear nectar does. Nectar made with water and simple table sugar at a 4-to-1 ratio most closely approximates the naturally clear nectar found in flowers. The Hilton Pond Center website has an image showing red dye #40 stains on a hummingbird at the site of excretion. And the dye also stains their excretions red. Naturalist and author Julie Zickefoose made this interesting observation while rehabbing a female hummingbird. The bird had been fed red nectar before entering her care, and she was shocked by the red droppings that the hummingbird continued to excrete for over a day after the red nectar was stopped. You can see pictures of the red-stained droppings and read Julie's blog post, but a more complete account is in the May/June 2010 issue of BirdWatcher's Digest. No more trips to the store to buy nectar. Make it at home. 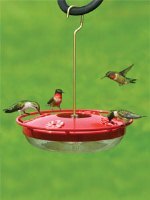 A simple 4-to-1 water to table sugar solution will attract and feed all the hummingbirds you can handle! Spread the word to family, friends, enemies, whoever you know that uses red nectar in their hummingbird feeders. Forward the link. Share the post link on your website or blog. Print a copy of the post. Just do what you can to stop the use of red nectar in hummingbird feeders. Do it for the birds! While my Mother laid in bed for nearly 2 and a 1/2 years due to a stroke and 2 broken hips . WE would do pretty much anything to ease her boredom and pain and see her happy . A kitten that God brought to us gave the kitten a good home and Mom, enjoyment. She always cared for the poor little animals that were dumped or orphaned . Well one day at Wal Mart I saw the hummingbird feeders . well getting to the point , we have three feeders now . a grown cat that watches the little angels buzz around . And God only knows how many hummers . Mom enjoyed watching them . They are there to greet us in the morning and when it starts to get dark go home to there nests. They are good for the heart. I know they were good for Moms by the smile on her face. I make about 16 cups of 4 to one 1 food for them and will discontinue using any food coloring (.Some of them remind me of jockeys . Little guys with big attitudes) . Pure enjoyment and wonder . Thank you God for all of your angels you put in our lives. SOOO much easier and "better", at least I think so, to make your own nectar. Other than 100% sugar, you KNOW that nothing else is added. I have noticed my hummys seem to be feeding on the gnats that swarm around the feeders as well. PROTEIN!!!! Cindy, the red dye is (1) not needed and (2) not metabolized, but passed through the hummingbird. No harm has been proven but most hummingbird experts say why risk it if it is not needed. First Nature sells red nectar because unknowing people buy it. They don't want to lose the $$$. Our store doesn't sell it and we actively encourage people to just make their own clear nectar with sugar and water. I've been using First Nature Hummingbird Nectar I bought at Walmart. I followed the dilution directions on the bottle and have been using it all summer. I haven't seen any dead birds under the tree they live in or under the feeder. My sister told me that commercially sold red-dyed nectar is dangerous to the health and safety of hummingbirds. I stopped using it and called customer service at First Nature. The rep said they couldn't sell the nectar if it wasn't safe for the birds to drink. I love my hummingbirds and want to protect them from harm. Any comments? Pat, thank you for being a good feeder steward for your hummingbirds!!! I have been using clear this summer. Hummers love it. When they can get it. I have a very persistent little hummer we call "fierce" who sits from sunrise to sunset on a tree near the feeder and chases any other visitors away. MINE!!!!!!! He says. Also would like to stress what you said. Keep the feeders clean and changed so Our summer in Tennessee has been 90 every day. We change our feeder every three days. No more red dye for us. Looks like maybe the hummers actually prefer the clear home made solution. I swore off red dye in my feeders last year. Heard it was bad for them. But now I understand why. It makes perfect sence. Thank you for the information. And since I started using clear nectar my hummer population not only didn't decrease, it actually has increasing! Its growing daily!! And they are such friendly little guys. I can hear their wings buzzing in my ears while they huver around me waiting for their fresh cool nectar Im filling their feeders with. Healthy Birds are Happy Birds!! Lets all work together to keep them their healthiest!!! We just discontinued. I purchased clear nectar and googled to see what the advantages which is how I ended up here. Thank you for the information and links. Lol I woke up in the middle of the night randomly thinking to myself oh my gosh! I hate red dye and it's so bad for your health my new hummingbird feeder is full of it ! Emptying it out and making the switch! Thank you!! Vivian, bats have been known to drink up nectar at night. The red dye is probably not good for them either though. :( Thanks for making the switch back! Millicent - thanks for switching to CLEAR NECTAR!! Theresa - NO. Read the post. I stumbled upon your site because I was looking for an answer as to why my red Hummingbird nectar was turning clear. I'm so glad I found you! This is invaluable information and I'm making the switch today! I love reading the comments from other Birders too! Thank you so much! My husband bought some red colored nectar and like me, was unaware of the harm the red dye might do so I will discontinue using it. I have made my own in the past and will resume that practice after seeing your tips. My question is, what other creatures like the red nectar? There have been a couple times when I have had 2 nearly full feeders at night only to find both of them empty and undamaged the next morning. My fenced yard does back up to common ground but I have never seen any other animals attempting to get the feeders that hang from my elevated deck. I've never had this happen with the clear solution. (I live in St.Louis, Mo) Any ideas? Christine, thank you so much and thanks for spreading the word on Pinterest! I have sworn off red dye for everything/anything. Thank you for the information about the red dye in humming bird nectar. I posted it on pintrist. I like many others had no idea how harmful it is. You are doing a great service by imparting this knowledge. Happy birding! Shirley, oh yes, orioles LOVE oranges. Cut oranges in half and if they find them, you'll have quite a show! Cheryl, thanks for staying away from red nectar!! Taylor, I use hot water to dissolve the table sugar completely, and let it cool off before filling the feeder. 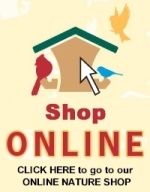 Thanks for checking out this post and have a great time feeding the hummingbirds! The Orioles have returned! My 4 year old grand daughter and I just made our own nectar...yes, from scratch and NO dyes. Now, I have heard from friends that they also like oranges. My question is Is that true? I try to avoid ANY product with red dye! It's hard!! But I had a dog years ago that after trial & error we found to be allergic to red dye! It was frightening! She would eat her food & then would swell up so much that she had trouble breathing. I had to give her benedryl & rush her to the vet. At the time MOST dog foods had red dye in them. At the suggestion of a very young teenage salesman at Petsmart we tried a dogfood that didn't have red dye in it. It worked & we never looked back! Red dye is a scary thing!